Ever since I was a kid, I’ve been fascinated with creepy crawlies, but dragonflies were always a favorite. I love how they’d appear to defy gravity as they hovered above the rippling water. 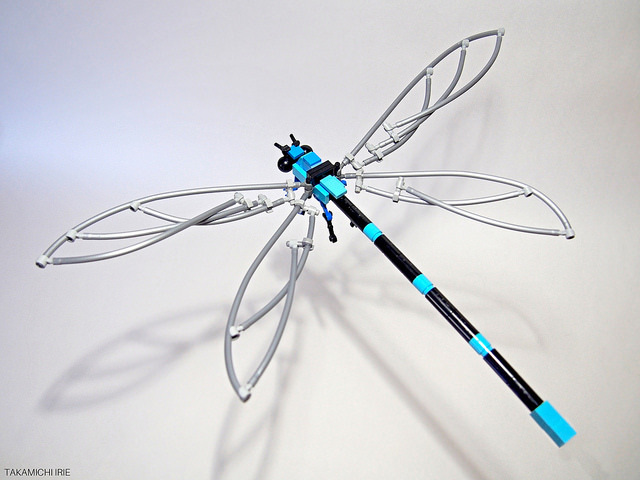 Takamichi Irie has recreated this iconic insect with a ‘handful’ of minifig parts (note all the minifigure hands used as connectors on the wings), some flex tube and a sprinkling of blue and black elements. With some sharp photography and clever use of lighting, it even appears to be hovering; all that is missing is the water.